SAN JOSE, Calif. (CN) – Google’s semi-secret research and development wing has been toying with how to store energy generated by renewable sources like solar and wind. Alphabet X wants to use the work of Stanford physics professor Robert Laughlin, who developed an idea that energy could be stored in vats of molten salt or extremely cold liquid to address a problem central to the nation’s energy grid. Solar and wind energy are also at the mercy of external forces of weather and climate, which don’t always jive with the peaks and valleys of electricity demand in a given city, state or region. Currently, there is no clean, cost-effective technology for storing the energy that solar and wind plants generate during off-peak hours for use later when demand spikes, according to Alphabet X. The company concedes there are solutions to sudden demand increases, but those currently used are expensive and inefficient, failing to capture all energy produced through renewable sources. 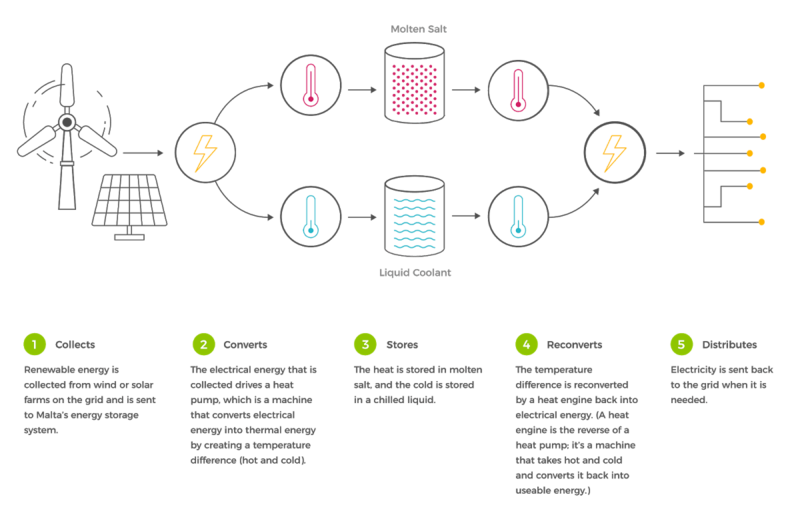 Energy collected from solar and wind farms or through geothermal activity would be sent to a storage unit: a large vat of molten salt kept at near-boiling, where the electricity is stored as thermodynamic heat. Alternatively, Laughlin – who won a Nobel prize for physics – theorized the energy could also be stored in cold liquid, similar to antifreeze used in automobiles, which would use similar thermodynamic principles to store energy. Energy stored in molten salt could be put on hold for days or even weeks, according to the theory. While Laughlin has proven the math for his system, Alphabet X wants to partner with leading technologists in the field to bring the theoretical ideas to market. “After more than two years building CAD drawings, running extensive computer simulations, and 3-D printing lots of parts, we have detailed engineering designs that are nearly ready to be turned into real machinery – down to the exact angle of each blade in a turbine and the strength and thickness of the material used,” the company wrote. Alphabet X touts the simplicity of the design materials, saying steel air and cooling tanks are all easy to obtain and use. The salts have reuse potential and also do not create hazardous byproducts. The vats can be placed anywhere, either close to the solar and wind farms or close to power generators that address peak demand. The tanks will have a 40-year shelf life, according to the company. “The next step is to build a megawatt-scale prototype plant which would be large enough to prove the technology at commercial scale,” Alphabet X said.